The three red dot scope is very popular with crossbow enthusiasts. The three red dot scope has a distinct advantage over the one red dot scope, because with a three red dot scope you have three separate distances sighted in by only sighting on the middle red dot. For fine-tuning, red dot scopes have both horizontal and vertical dials for sight in adjustments. Inspect your three red dot scope and make sure that it is correctly mounted on the shooting rail of your crossbow and that the mounting screws are tightened. Shoot from a stable object, such as a table or bench. Power on the three red dot scope. Sight in the middle red dot at a distance of thirty yards from the target. Shoot two or three bolts before adjusting the scope. If the scope needs to be adjusted, adjust the middle red dot toward the error. For example, if your three shots form a pattern which are left and above the intended target, move your middle red dot left and up to the shot pattern. Turn the elevation adjuster clockwise to move the red dot up. Turn the horizontal adjuster clockwise to move the red dot right. There are several types of three red dot scopes on the market, and adjustment techniques can vary; therefore, it is important to refer to the specific sight-in directions that came with your three red dot scope. Sighting in the middle red dot of a three red dot scope at thirty yards automatically sights in the upper red dot at twenty yards and the lower red dot at forty yards. The ten yard increments for the three red dots will allow you to make quick adjustments in shooting distances. Shoot bolts in groups of two or three until your shot pattern is consistently hitting the desired target. You can also sight in your three red dot scope at other distances from the target. Check the red dot scope battery for proper installation. In order to save wear and tear on bolts, always use an archery or crossbow target. Shoot the bolts that have been recommended by the crossbow manufacturer. 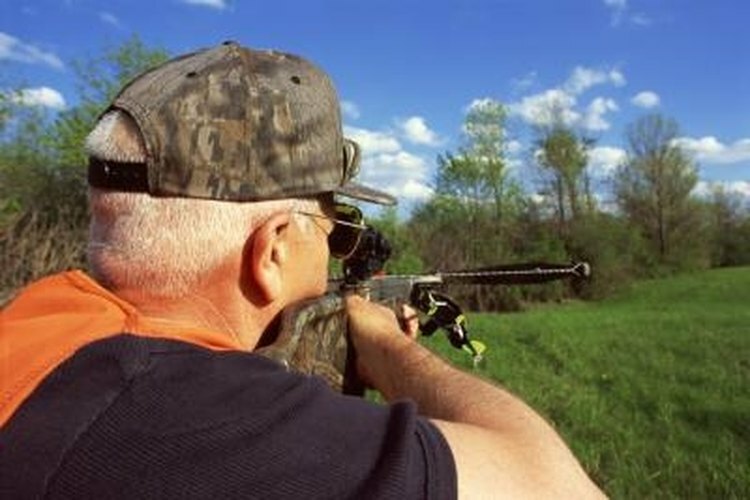 Target shooting should be conducted in a safe place, such as a shooting range. Always aim your loaded crossbow downrange. Keep your hands and fingers below the flight track.